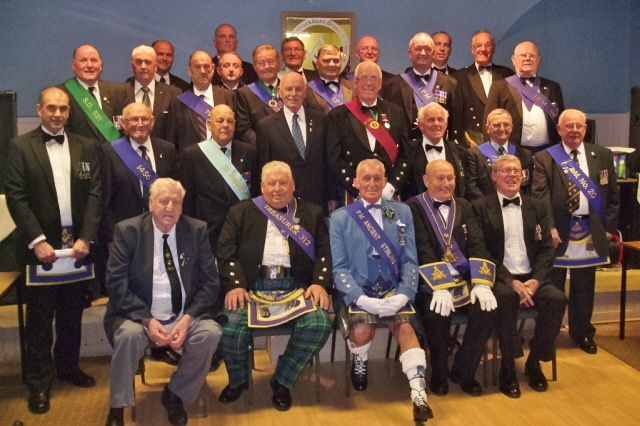 Ex-servicemen from a number of Lodges in the Province of Stirlingshire took part in a first degree at Lodge Bannockburn Bruce and Thistle No. 312 on Friday evening 8th June 2012. The ceremonial was dedicated to the memory of the late Brother Alex. Buchanan PM Lodge No 312, himself a serving soldier. There was an extremely large turnout of brethren who each received a commemorative scroll on leaving the temple. The photograph below shows the deputation of ex-servicemen with the RWM Brother Martin Gray prior to being piped and drummed into the Lodge.